A field of 11 juvenile fillies went to post for the Group Two contest and Aidan O’Brien was double-handed, with Fleeting the apparent second string behind the Ryan Moore-ridden Peach Tree. The latter was on the pace throughout before fading, while the trainer’s son, Donnacha, settled 12-1 shot Fleeting towards the rear before angling wide to throw down his challenge on the far side. The hat-trick-seeking Star Terms was in front racing inside the final furlong, but Fleeting saw out the straight mile best to get up and score by a length and a half. Star Terms galloped on for second, ahead of Sand Share in third, but Dubai Beauty, the 11-8 favourite following an impressive debut at Newmarket last month, was bitterly disappointing. 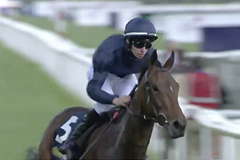 Paul Smith, son of part-owner Derrick Smith, said: “Donnacha said she was a bit fresh going down to the start, so he took his time with her and in hindsight with that headwind that was probably a good thing. He added: “She got the mile well. We’ll look at the Fillies’ Mile and the (Prix Marcel) Boussac. They will have to be on the radar now. Coral went 33-1 about Fleeting for the Qipco 1000 Guineas and 25-1 for the Investec Oaks. Richard Hannon said of runner-up Star Terms: “She travelled very well, settled and she looks like a very good filly. Ralph Beckett, trainer of third home Sand Share, said: “I’m very pleased with her. It was a good effort first time on the turf. “She’s a big old girl and will improve for a winter on her back, so we’ll see where we go from here. I couldn’t be happier. The May Hill Stakes was initially run as a Group Three race in 1976 when Triple First prevailed for trainer Sir Michael Stoute. The race is named after May Hill, winner of the 1975 Park Hill Stakes at Doncaster as well as the Yorkshire Oaks at York. It was upgraded to Group Two level in 2003 when Kinnaird took the spoils for North Yorkshire trainer Patrick Haslam. The filly went on to win the Group One Prix de l’Opera in 2005. The mile contest for juvenile fillies was dominated by the late Sir Henry Cecil, who chalked up 12 victories between 1978 and 2001. The race has produced two Oaks winners in Midway Lady (1985) and Reams Of Verse (1996), while the former also captured the 1,000 Guineas en route to Epsom success in 1986.